Hi, I am interested in your 1954 Chevrolet 3100 (stock #5133-CHA) listed on Autotrader for $34,995. I'd like to get more information about this vehicle and confirm its availability. Patina trucks teach us theres more than meets the eye. After all, with a terrific gloss, upgraded A/C interior, a fresh crate V8, and much more, this 1954 Chevrolet 3100 pickup has a cool kind of confidence that goes beyond its worn-in appearance. While this has the unmistakable look of patina and a weathered barn wood truck bed, youre really looking at a restoration that was completed in 2017. Thats why the worn-in look of this carefully crafted paint is augmented by a clearcoat. 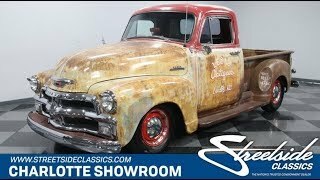 The result is a cool classic pickup that looks like youre preserving a barn find shop truck and it even has the antiques store graphics to drive this point home. But as you take a closer look, you also see how much thoughtfulness went into this build. The proof is in the full custom pinstripe package, including the rear fenders curved spare tire insert thats now used for more cool shop truck script. Plus, theres more distinction in the details, everywhere from shining bumper and grille, to the lowered suspension, to how the red wheels provide a preview of the interior. Plenty of bright red, supple black, and pinstriping await you inside. But while this gives you a worn-in look on the outside, the interior is filled with modern comfort. The bench seat has comfortable cloth inserts for where you sit and beneath the plush carpeting is Dynamat insulation. Theres a retro-style AM/FM digital tuner that has a Bluetooth connection, and you stay cool with modern R134a air conditioning. Even with all these upgrades, you still get a great classic pickup feeling from the vintage-style steering wheel and large factory-style gauge package. While the exterior tries to hide its upgraded look, the engine bay cannot conceal all the great modern investments. Youre looking at a fresh 350 cubic-inch crate motor. It inhales deeply with a four-barrel carburetor and exhales with extra power as headers feed the dual exhaust. Plus, you have the right supporting components with taut belts, good hoses, and an aluminum radiator w/electric fan to help keep this pickup running cool even if youre in traffic with the A/C pumping. This truck was clearly built for driving, thats why you have the new tubular A-arm front suspension, power steering, front disc brakes, and a three-speed automatic transmission. Complete with build receipts and restoration photos, this is an exceptionally cool patina custom thats unique, fresh, and all-around comfortable. So dont miss out on something this distinct. Call now!